Issuer alerts, compelling responses and real-time dispute resolution – in one tool. NOT a fraud filter, this is automated dispute management and revenue recovery. Works with Stripe, PayPal, Authorize.net, First Data, WorldPay, Braintree and more. Chargeback is a Utah-based software company that automates post-transaction fraud and dispute management. We know your goal is to maximize revenue, that's why we created the Chargeback App. This dispute management tool picks up the ball where fraud scoring and manual reviews fall short, enabling you to efficiently minimize lost revenue and increase profit. Chargeback is the only dispute management platform designed to empower your team, not replace it. Identifying and gathering the data required to respond to a single dispute often requires logging into three separate systems: your storefront, payment gateway and merchant account processor. By consolidating the data from each, the Chargeback App helps you stop disputes in real-time and craft detailed response documents that adhere to the chargeback rebuttal rules set by Visa, MasterCard, American Express and Discover. The Chargeback App provides expert guidance and support at every stage of the dispute lifecycle to protect your revenue. Chargeback Alerts are enhanced notifications that allow you to take powerful actions like instant gift card deactivation, cancel recurring billing, and services suspension. Allowing you to prevent fulfillment of goods and services for which you won't receive payment. The Chargeback App equips you with a first-of-its-kind response generator. Order, customer, transaction, and dispute data is auto-populated into responses based on current card network rules and regulations. Wave goodbye to tedious data pulling and copy+paste nightmares. The Chargeback App quickly identifies and aggregates your data so you can respond to alerts and disputes immediately. Order, transaction, alert and dispute data is aggregated into a single record. Guided workflows help you add required and optional evidence blocks. A multipage PDF and DOCx is generated and sent back to the issuer. Chargeback integrates with the most-widely used shopping cart technologies and payment providers including Stripe, Braintree, PayPal, CyberSource, Vantiv, First Data, WorldPay and many more. Everything you need is right here. Make your team better and simplify your dispute management. 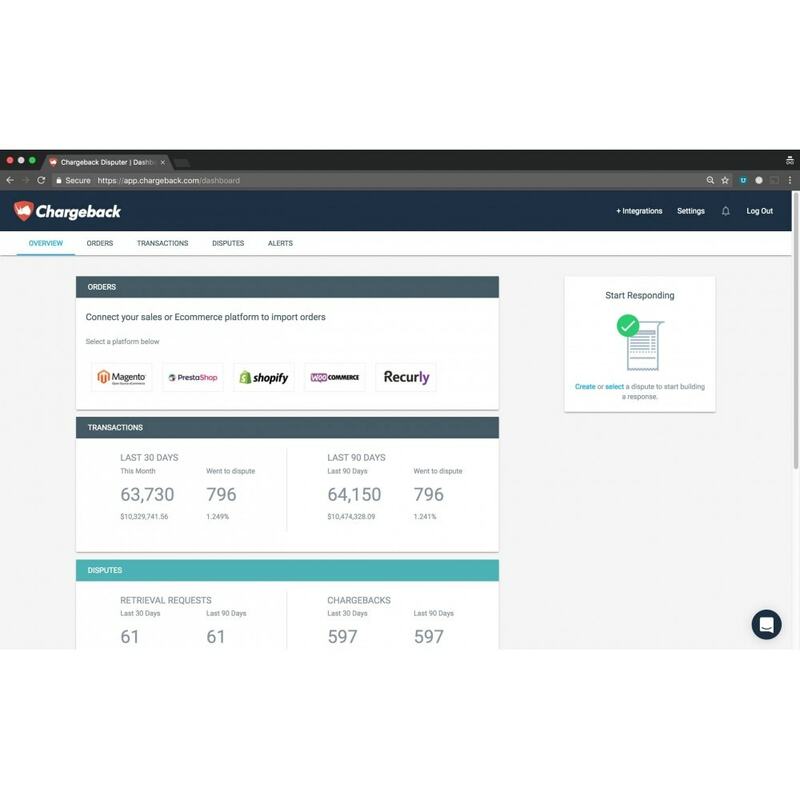 This module connects your PrestaShop store to the Chargeback App and aggregates relevant information from your store, payment gateway and merchant account. This module does not affect the appearance or operations of your store. The Chargeback App will notify you of every new dispute so you can start responding immediately. Upload compelling evidence through a guided experience and generate a downloadable response document as a PDF or DOCx. Certain issuers offer notifications of customer disputes through the Chargeback App, allowing you to take evasive actions like issuing a refund, rerouting shipment, and preventing fulfillment to stop the dispute before the transaction become a chargeback. Includes training, unlimited technical and feature support, as well as access to updates. 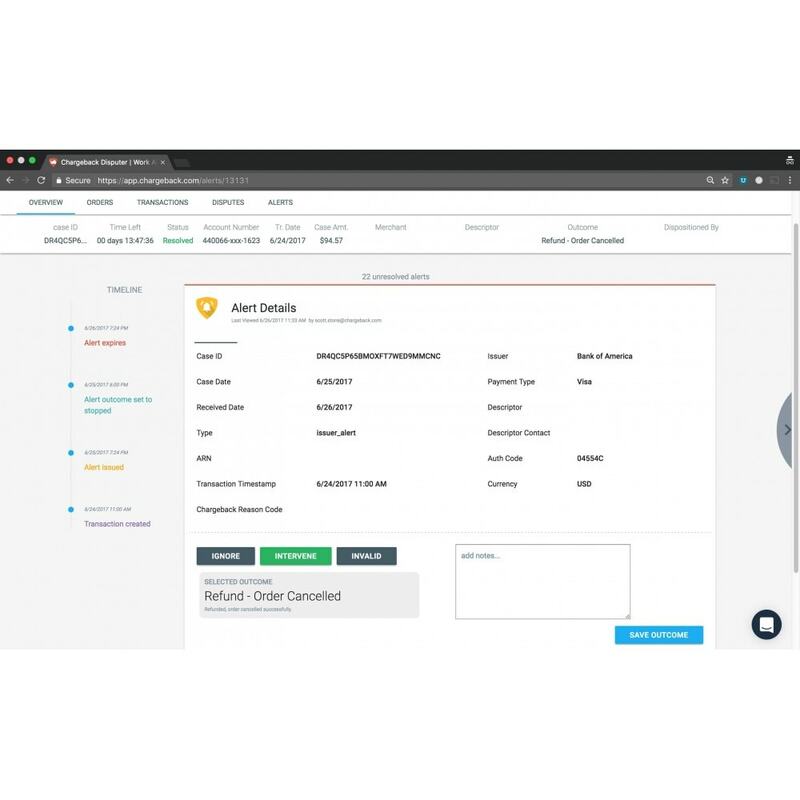 Chargeback uses SSL technology to enable encryption of sensitive information, including passwords and credit card numbers. Firewalls, penetration testing, and Amazon Cloud Services (AWS) ensure your data is secure. Chargeback is certified PCI compliant by Security MetricsTM. You must have an account with Chargeback to use this module. You must connect your payment service provider(s) to your Chargeback account as well as other relevant data sources to enjoy the full scope of benefits of the Chargeback App. You can create an account during the installation of this module or sign into an existing account. The Chargeback App is currently only available in English. Learn about dispute management for PrestaShop at https://chargeback.com/prestashop. This module requires your payment processor and gateway to be connected to Chargeback. Install the Chargeback module into your PrestaShop store. Connect your Chargeback account or create a new one. If you already have a Chargeback account, follow the link to LOGIN and input your username and password. If you do not have a Chargeback account, follow the link to CONNECT YOUR CHARGEBACK ACCOUNT and fill out the short form. After you log in or create a new account you will be redirected back to PrestaShop while your store and your Chargeback account sync. After your PrestaShop store and your Chargeback account sync you will be redirected to your Chargeback account. If you’re not automatically redirected follow the link to go to your Chargeback account. Connect your store’s other Data Sources to Chargeback. NOTE: You MUST connect your store’s Payment Service Provider(s) for Chargeback to function. El módulo reCaptcha más completo que protege su tienda contra el spam y el abuso, al mismo tiempo que permite que la gente real pase con facilidad. Se puede utilizar para el contacto, inicio de sesión de fondo y formularios de registro. Anti Spam qq.com, mail.ru + reCAPTCHA CAPTCHA protege su tienda contra más de 2000 proveedores de correo electrónico no deseado y desechables, protege las formas de su tienda mediante el uso de reCAPTCHA de Google y CAPTCHA invisible.